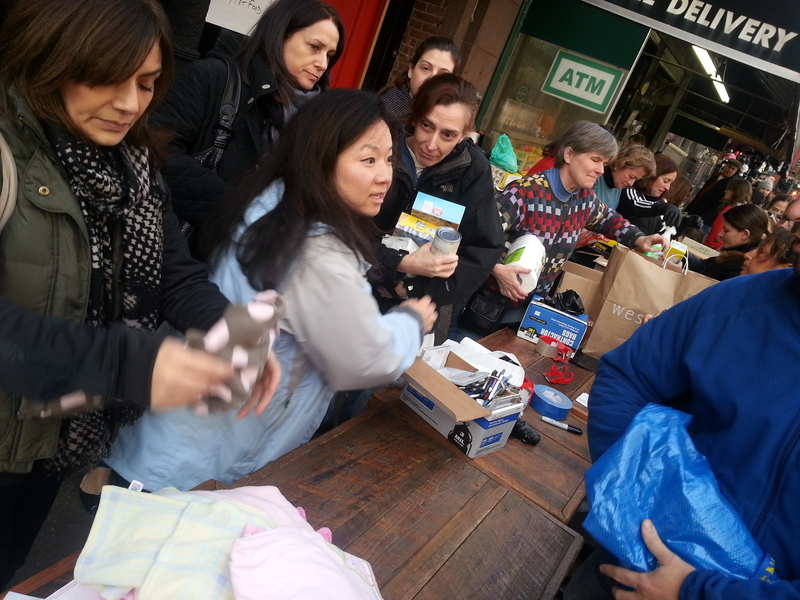 Volunteers on the Upper West Side taking donations. First off, Mary Kate Burke updated her efforts in the Rockaways. Read that here. Secondly, there is a paypal account (here) set up through the Knights of Columbus Council 443 that will aid their efforts. As temperatures drop (it is COLD tonight in New York City) think of the goods donating to this account will help buy. It’s nice to see individuals stepping up. My neighbor, a New York City schoolteacher, is collected donations in our building and drove them to Staten Island with a friend. She’ll return this Saturday. And local soapmakers Daniel and Zaida Grunes of Manor House Soaps donated about 30 pounds of their yummy product to George Washington High School in northern Manhattan, where a temporary shelter was set up. I went to the Upper West Side yesterday (Nov. 4) to drop off at a collection point organized by the Contemporary Roman Catholics and local restaurants, Firehouse and Nonna. It was PACKED. There were more volunteers than sorting space and Upper West Siders showing up with giant bags of clothing, towels, toiletries, work gloves, etc. 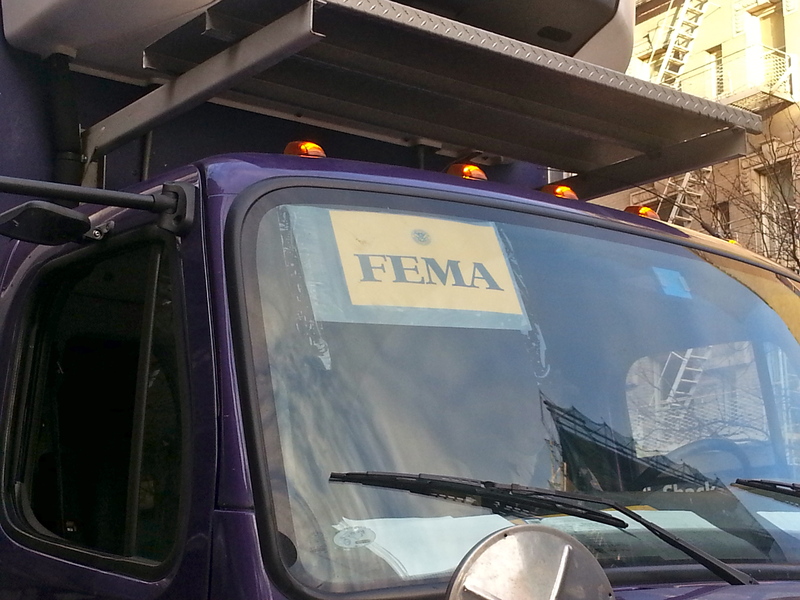 It was nice to see that the FEMA truck being packed up was headed to the Rockaways. Truck filled earlier went to the hard hit areas of the Coney Island, Long Beach, South Brooklyn, Staten Island and New Jersey. And because this is New York City, many restaurants, bars, bands and DJs are getting into the action. “The Restaurant Group,” which consists of Upper West Side eateries Fire House, Nonna, A.G. Kitchen and Il Cibreo, are offering free dessert to those who bring a donation. You can also head over the Bowery Electric, where the Bad Brains tribute show will also serve as a Hurricane Sandy fundraiser. One hundred percent of the profits from Navegante’s Nov. 9 show at The Flat in Brooklyn will benefit Sandy victims. 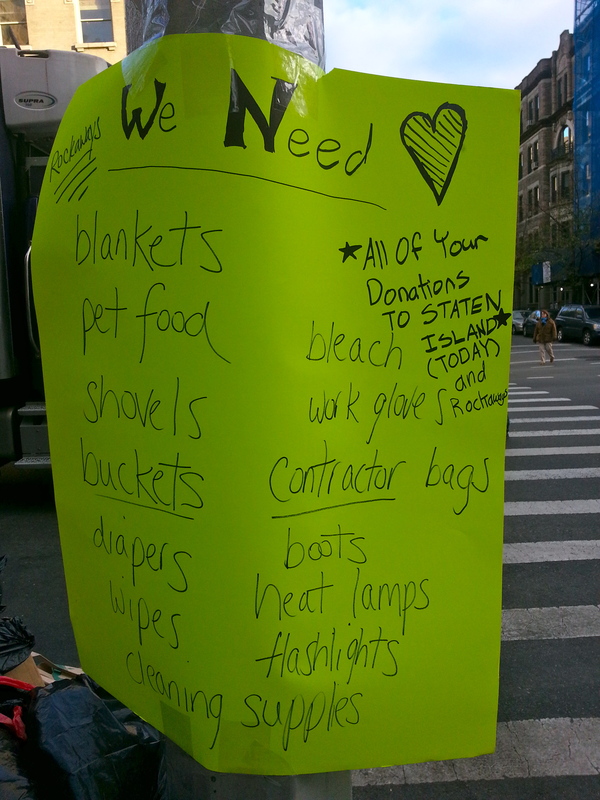 Uptown businesses, such as APT78, Dyckman Bar, and 181 Cabrini, are collecting goods. One of the best things I read today was this report about how many of the folks who organized Occupy Wall Street are behind Occupy Sandy. They’re even looking to expand to New Jersey. They have also set up a “wedding registry” on Amazon.com, so it’s very easy to help them! 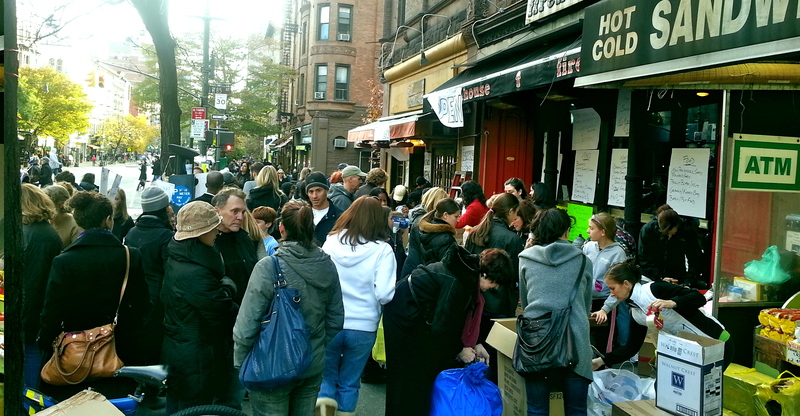 Occupy Sandy, an off-shoot of Occupy Wall Street, has undoubtedly been a leader in spreading the word about local volunteer and donation efforts online, and thereby spurring real, tangible responses. Though certainly not a well-oiled machine by any means — seamless organization is hardly expected, anyway, in a movement that sprang up so quickly — the group’s Twitter and Facebook accounts have posted up-to-date information about exactly what is needed and where. And while the Red Cross doesn’t take donations of individual household items and certain bare necessities, these very same needs have become Occupy Sandy’s primary focus. Read more in the Huffington Post here. This truck was filled and headed to the Rockaways. Volunteers and donors on the Upper West Side.